A TreeCard can be great tangible gift for your customers or employees. A TreeCard is a paper post card (7*5 inch) that can be fully customised in line with your branding guidelines. The only thing EcoMatcher adds is a QR code. 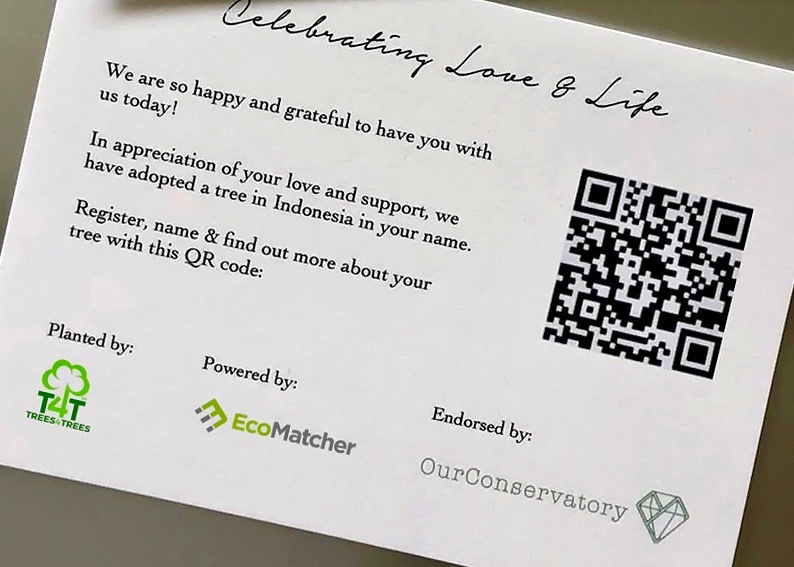 Once that QR code is scanned, the TreeCard recipient will be able to track his or her adopted tree instantly and learn more about the tree and farmer. As a TreeCard is light weight, you can also opt to send the TreeCard by regular post. You can opt to download the TreeCards as a PDF and print the TreeCards by yourselves, or we can do that for you. EcoMatcher works with the Green Pagoda Press Ltd, a bespoken printing company in Hong Kong. Green Pagoda uses soy-based ink and paper from renewable resources, returns all toner cartridges to the manufacturer for reuse and recycling, and even provides two vegetarian lunches to their team every month.